Description - UltraDeck Portable Event Flooring provides superior protection for natural and artificial grass for any outdoor event. Requiring no tools or special training to assemble the floor, this modular event flooring is perfect whether you are putting together a small area for a backyard wedding or a floor the size of a stadium. UltraDeck is available in two options: perforated for use over natural grass to allow sunlight and liquids to flow through, and smooth for use over synthetic grass to stop liquids from flowing through. These modular event flooring tiles can be used indoors as well, but are wonderful for protecting grass surfaces and can be reused for multiple events several times. Size - Each section is 12" x 24"
Recommended Uses - UltraDeck event flooring is recommended for use in high traffic environments, such as concert events, weddings, conferences, festivals, graduations, car shows, and more. UltraDeck is designed to be installed over grass, gravel, sand, dirt, and mud. Each set of tiles can be easily connected by simply aligning the T connectors with the T receptors on each tile. These can be connected horizontally, vertically, or can be stepped to create a unique pattern. As a rule of thumb, begin installation in the upper right hand corner of the space, working your way out to the left. Continue connecting tiles going from the right to the left to assure correct alignment of the tiles. Heavy duty modular system for stadiums, arenas, concerts, trade shows, conferences, and more. 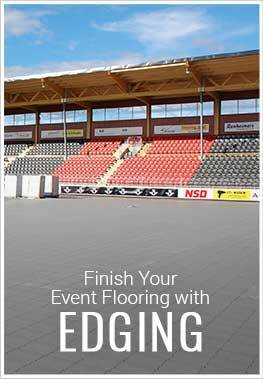 Snaps together quickly and easily for faster setup compared to other event flooring types. Can handle loads up to 20,000 lbs per square foot. Great for tent events over natural or artificial grass. No tools or training needed for installation. Hides cables and wires underneath the tiles. Easy to disassemble, transport, and reassemble for multiple uses.